Lherison Debreus (also spelled Debrise) was born in 1971 near the second largest city in Haiti, Cap Haitien. His mother left for Port-au-Prince when he was little and settled in the Bel Air area near (vodou priest and flag maker) Tibout's house and temple. When he was fourteen, Lherison joined his mother. He would hang out at Tibout's temple, which bustled with activity.... Lherison began participating in the atelier, which included flag making. In 1994 Tibout died. Lherison was on his own. He decided to continue making flags. Also, he stepped up his activity of scouring the countryside looking to buy sacred objects that he could sell in Port-au-Prince. He combined this business with another in which he acted as an agent for some of the sculptors who worked in the Iron Market. 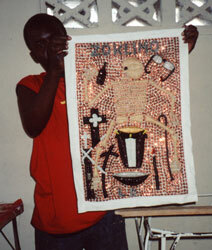 The famous artist, Pierrot Barra, was one whose work Lherison would sell to buyers... excerpts from Spirits in Sequins: Vodou Flags of Haiti by Nancy Josephson.